The Mahlke Chronicles: Dream big, kid. I love how our weekly theme and real life collide and almost effortlessly coexist, especially without an ounce of planning by me. And, more importantly, how these things fuel a genuine interest in my children that goes beyond a moment of entertainment or education. Last week our theme was airplanes and helicopters--anything that flies in the sky, really, since Spencer insisted on lumping rockets in this category as well; and who am I to put limitations on what he wants to learn about on a any given day? 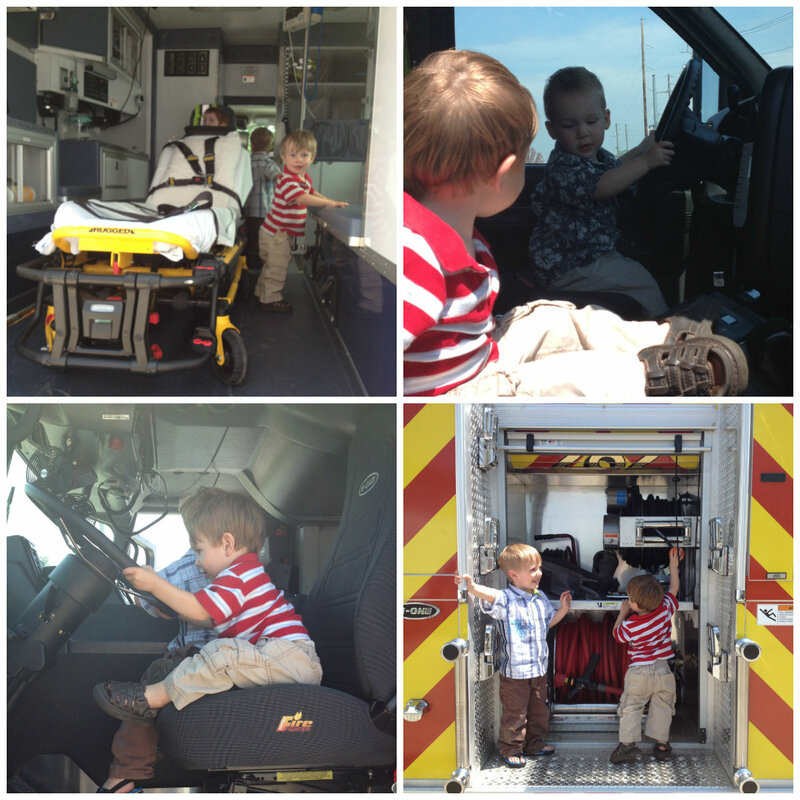 This theme coincidentally aligned with the same week our small town community was celebrating EMS appreciation, where a Mayo One helicopter--a rescue helicopter, Spencer's all-time favorite--makes a guest appearance. Now talk about hands-on learning--the ultimate field trip for a boy with little helicopters for stars in his eyes. We started our theme by a trip to the library to stock up on an overflowing bag full of books about airplanes, helicopters, and rockets--plus we couldn't leave without putting some train books in the bag as well, of course. We read the books cover to cover, and I soon learned that Spencer's new love for rescue helicopters far trumps his old interest in rockets. If we were reading about helicopters that only carted passengers, not sick people, or patients, as we learned they are called--a rescue helicopter is like an ambulance in the sky, after all--then he had no interest in reading or learning about it. We learned all about the parts of an airplane over snacks one day, studying a diagram I got off the internet. I used our ceiling fan as a visual aid to explain the blades on the propellers, a visual aid that Ashton really enjoyed since he has a weird fascination with them anyway. For our first activity, I had to do a little research myself, the YouTube variety. You see, I could not recall how to make a paper airplane. Thank goodness for the silly people who actually take the time to make a two minute video explaining the intricacies of folding a piece of paper into an airplane. I made airplanes out of three different kinds of paper: printing paper, construction paper and sturdy card stock. I showed these to Spencer and Ashton, and asked them to make a hypothesis (and then had to explain what this big word meant) about which airplane would fly the farthest and why. Hypothesis #1: Which paper airplane will fly the farthest? Spencer picked the card stock, stating, "It's the heaviest." Ashton just pointed without much thought, agreeing with his big brother. I decided we needed to practice the art of paper airplane throwing before heading outside on the windy day, so I then turned that into an opportunity to form another hypothesis. Hypothesis #2: Will the airplanes fly farther inside or outside? Spencer indecisively chose outside, saying, "the wind will make them fall...or go farther. Maybe both. No, fall. Wind will help it fly." And then added, "They don't have propellers?" I am no scientist, but I am fairly certain our experiment was very, very flawed, and the results were inconclusive....although we had fun anyway. One morning over breakfast we did some airplane-themed worksheets. And another afternoon we did an airplane craft. Although Ashton's main focus was still to eat as much of the glue stick as he could before I took it away, Spencer assembled all the parts of the airplane correctly by himself; and then he asked if he could do another one. We concluded our week with a helicopter worksheet. And then came the infamous field trip that Spencer still talks about. Just yesterday, out of the blue, he asked me, "Remember the helicopter, Mommy?!" After a hotdog lunch and investigating an ambulance and firetruck, we waited for the main event--the Mayo One helicopter. Everyone gathered around and we watched as it whizzed closer to us and then circled around before finally landing on the grass of the fire station. Both my boys stared in awe, pointing, excited to see this beast up close. Dave asked the pilot if he'd mind shaking Spencer's hand, and then I made them redo it so I could get a picture. 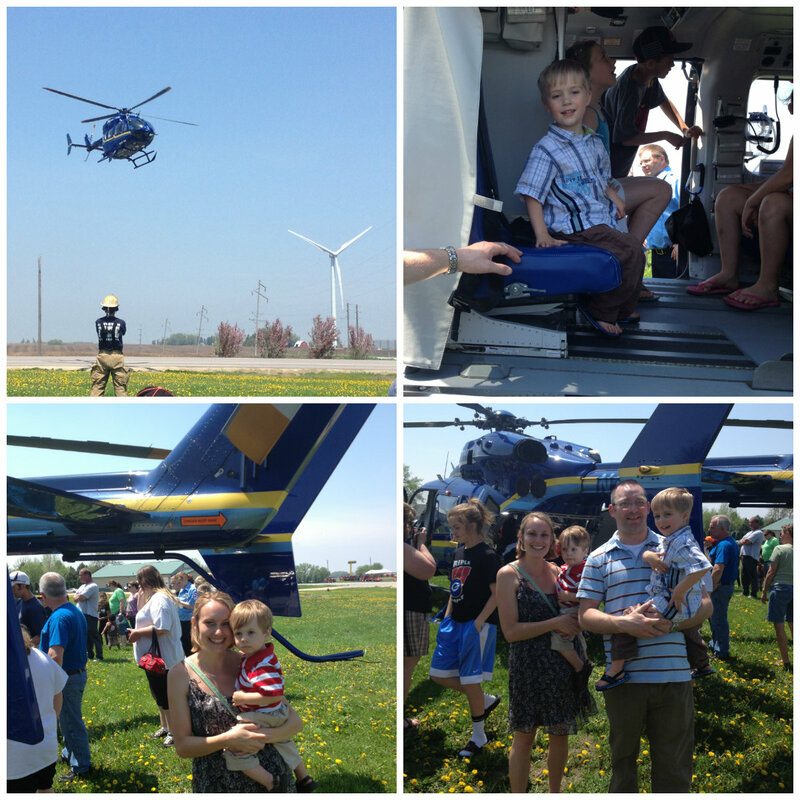 Shaking the hand of a rescue helicopter pilot made Spencer's day. Currently that is what he wants to be when he's big. Last week it was an astronaut. Dream big, kid; just keep dreaming, always. Last week we also met our friends at the park for a picnic supper and walk around the lake. 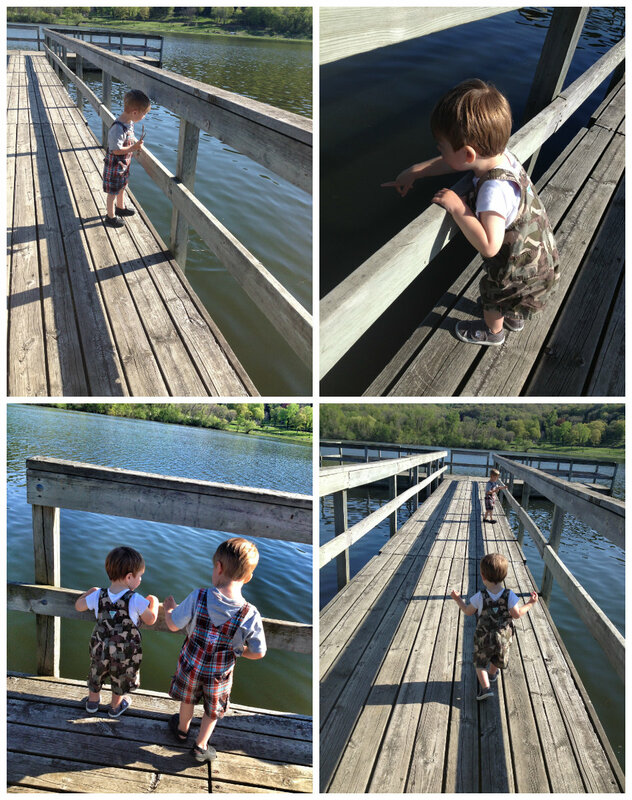 The boys had fun on the dock while we waited for our friends to arrive, tossing handful after handful of rocks into the water. And we had Spencer's end of the year preschool picnic, which successfully managed to give me the end of the year blues. If my baby is nearly done with his very first year of preschool, surely that's big enough evidence of the fact that he's truly not my baby anymore. Right? It was beach day at preschool, and he picked this fishing outfit over a Hawaiian shirt. 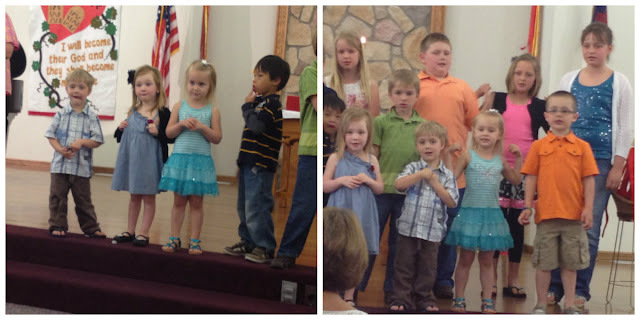 Speaking of end of the year events, Spencer also sang at church this past Sunday, bidding Sunday School farewell for the summer. 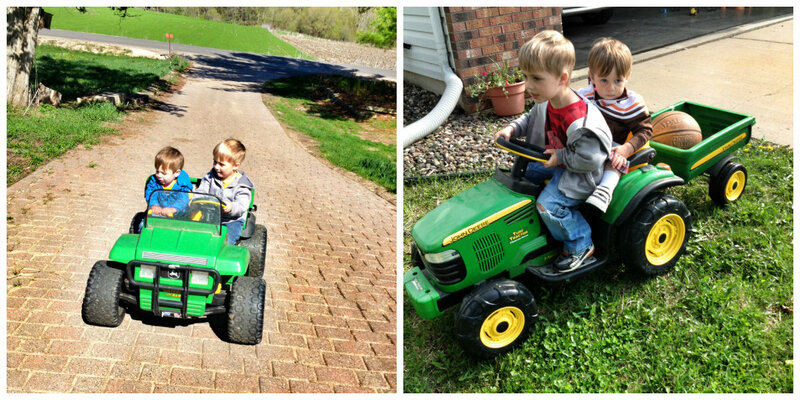 At Grandma's house there are two seats in the tractor and no fighting. At home Mommy is mean for making them share a seat. Every once and again I get a night to myself. This is what I did once I got the opportunity: walked around the lake and then read a library book. He is going to take a year off to backpack through Asia?! That's so funny! I'm constantly telling Spencer to stop getting big, because I just cannot believe how fast it's going!!!!! Yeah, Rhys wants to do exactly what daddy did/does:) and then Tristan wants to do what Rhys does, and Ollie is usually following behind trying to keep up. Stay small boys!